Mercer County, organized in 1838, was formed out of portions of Hunterdon, Burlington, and Middlesex Counties, and was named in honor of General Mercer, slain at the battle of Princeton. (at one time called McKonkey's Ferry, later Bernardsville, or Eight Mile Ferry) On the Delaware where Washington crossed Christmas night 1776 previous to the attack upon the Hessians at Trenton. The site is being developed as a memorial park by the State. Tavern at Washing, ton's Crossing figures in the crossing of the Delaware by Continentals. First settlement at the Falls of the Delaware made about 1679. Meeting house built about 1690 at Fallsington. 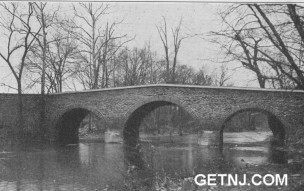 Trenton, originally called Stacy's Mills after Mahlon Stacy, builder of the mills, was named from Colonel William Trent, who purchased a farm of eight hundred acres on Assunpink Creek in 1714. Trent was, in 1723, Speaker of the New Jersey Assembly and Commissioner for Hunterdon County. The County Courts which had been previously held at Hopewell were removed to Trenton in 1719. Battle of Trenton took place December 26, 1776. Five Points, where Washington's troops came into position and planted cannon, marked by Trenton Battle Monument. Site of Hessian Sentry Post, opposite St. Mary's Cathedral. 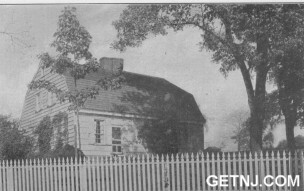 House where Colonel Rahl died. Marked by a tablet. West side of Warren Street. Site of Hessian Surrender, approximately near the Public Service Building, East State Street. Tablet marks spot. Old Barracks, built by British at the time of French and Indian War, containing collection of relics and antiques of exceptional value. Building reproduced as New Jersey State Building at Sesqui-Centennial. Douglas House, now facing on Stacy Park and not in original location. Washington held a council of war here January 2, 1777, with his officers, in which the plan of escape from Trenton and attack on Princeton was made. Original site of Douglas House marked by a tablet. Governor's Mansion. South Warren Street. Site of the Hunterdon County Court House and meetings of Continental Congress. Stone marking achievements of John Fitch, who sailed his steamboat on the Delaware prior to Fulton's boat on the Hudson. Site of Triumphal Arch in honor of Washington, on South Broad Street. Bloomsbury Court. South Warren Street. Home of William Trent, founder of Trenton. Later home of Cox family. Washington, Lafayette, and Rochambeau enter, tained here. An ash tree planted by William Trent still stands in the Colonial Garden. The Hermitage. On the River Road. Erected by the Rutherfurd family prior to Revolution. Purchased by General Philemon Dickinson in July 1776 after the Declaration of Independence. John Adams was entertained here by General Dickinson in 1777 and later was here during the cholera scare in Philadelphia in 1798. Bow Hill. Three-quarters of a mile from Trenton. Lalor Road near Deklyn Lane. Red brick house famous as the home of Annette Savage of Philadelphia for whom the house was rented by Joseph Bonaparte. The house was jocosely called "Beau Hill." Methodist Episcopal Church. South Broad Street. Presbyterian Church. East State Street. Chartered by George II in 1756. Friends Meeting House built 1739. Hanover and Mont, gomery Streets. Site of Battle of Assunpink or Trenton Bridge January 2, 1777. Behind this stream watch fires were kept burning while Washington's Army marched from Trenton to Princeton. After taking Trenton December 26, the Continentals crossed the Delaware and remained for several days, returning again and taking possession of Trenton where they remained until January 2, 1777. The British Army on the apposite side of Assunpink, expected an engagement the following day. During the night Washington, leaving his fires burning and sentries posted, marched around the British Army toward Princeton, which he reached the following morning. The first information of his retreat received by the British was the sound of firing from the direction of Princeton. (originally called Maidenhead) About five and one-half miles northeast of Trenton on the road between Trenton and Princeton. Site of a Presbyterian Church built 1752 and of Lawrenceville School. The British passed through Lawrenceville in pursuit of the Continental Army on the night of the Battle of Princeton. 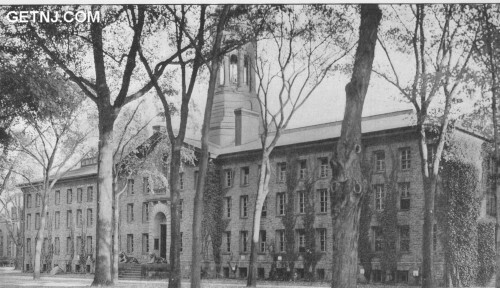 Site of Princeton University, formerly The College of New Jersey. The College, originally chartered by John Hamilton, acting Governor 1746-7, was first located at Elizabeth, where Rev. Jonathan Dickinson was President. Subsequently it removed to Newark where Rev. Aaron Burr became President. 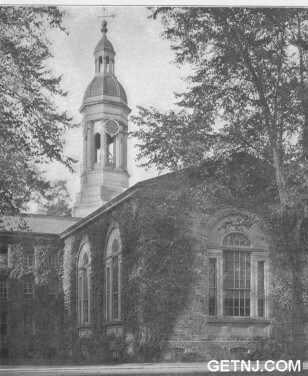 In 1757 it removed to Princeton where Nassau Hall, first college building, was erected and named at the request of Governor Belcher in memory of King William III. Nassau Hall was occupied by the British as a barracks and stable during the occupancy of the town. The original building was partially destroyed by fire in 1802 but the stone walls remaining standing were utilized in its re-erection. The chapel had a picture of George II which was shot from the frame during the battle and later replaced by a picture of Washington by Peale. Tablet marking road to Morristown. Monument to British and American Soldiers. Tusculum. Home of John Witherspoon -- in the suburbs of Princeton. Prospect. Farmhouse of Colonel George Morgan.